The Logitech Keyboard K120 gives you a better typing experience and features a comfortable, quiet, sleek yet sturdy design with a plug-and-play USB connection. Logitech Keyboard K120 - a better typing experience that's built to last. You’ll enjoy a comfortable and quiet typing experience thanks to the low-profile keys that barely make a sound and standard layout with full-size F-keys and number pad. This spill-resistant keyboard* also features a sleek yet sturdy design, a plug-and-play USB connection, easy-to-read keys, and can withstand up to 10 million keystrokes**. Setup is simple too. You just plug it into a USB port and start using it right out of the box. Bold, bright white characters make the keys easier to read. 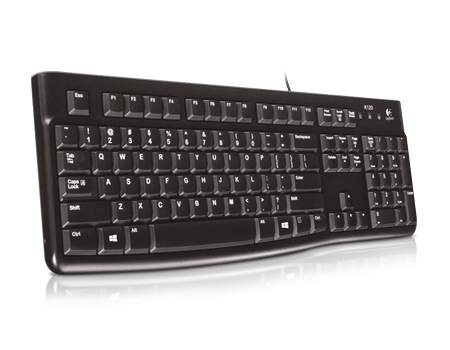 And it all comes with the high quality and reliability that’s made Logitech the global leader for keyboards and mice.